It aims to offer an insight into the development of powdery mildew identification techniques since the start of my PhD in 2013. Enjoy. I will be presenting this poster at the conference in one of many poster sessions alongside concurrent oral presentations for the 1000+ delegates present. 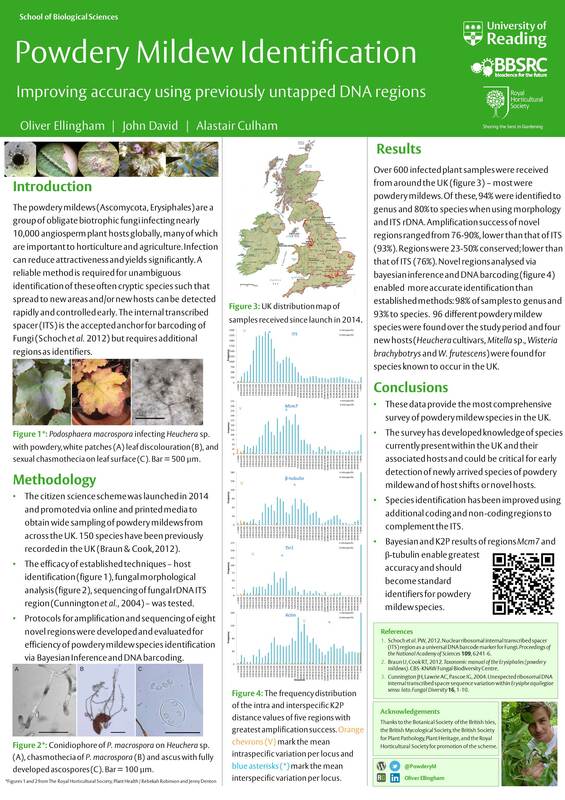 This entry was posted in PhD research, Public Engagement with Science, RHS research and tagged #PowderyM, Annual Conference, Conference, Edinburgh, Erysiphaceae, Erysiphales, Fungal identification, Microbiology Society, Oli Ellingham, Oliver Ellingham, Powdery Mildew. Bookmark the permalink.